It all started with a dream and a glimmer of hope for downtown Jefferson City when In 2010 Jefferson City’s downtown area was chosen as one of only four locations in East Tennessee to participate in the state’s inaugural Tennessee Downtowns Program, a community improvement program for cities and counties seeking to revitalize traditional commercial districts. “With this support from the state as well as other local stakeholders, we we’re ready to once and for all tackle the issue or our struggling downtown,” says, Michael Evon, founding President of the Mossy Creek Foundation. After months of preparation, planning and gathering public input, the group began executing plans in 2011 that they hoped would bring positive change to the downtown and make the city a better place to live. Members of this group have been meeting regularly since early 2011 to develop a solution to address the multi-faceted problems that currently affect the downtown area of the city, and results are slowly but surely beginning to show. This committee is currently working within four major areas to help bring new life into old Mossy Creek. These four areas include Planning, Promotion, Organization, and Economic Restructuring. These areas are consistent with the National Main Street Program that has been proven successful in addressing the full spectrum of interrelated issues that affect traditional commercial districts for almost 30 years in over 2500 communities throughout the United States. In 2016 the group began construction on Mossy Creek Station, a depot-inspired events pavilion and park area, that has become a stronghold in bringing events and commerce back to the downtown. The completion of the park and pavilion has given new life to old Mossy Creek and a new vision for a brighter day for downtown Jefferson City. FROM VIRGINIA TO TENNESSEE. Mossy Creek was founded in 1788 when Adam and Elizabeth Sharkey Peck floated down the Holston River with their seven children from Virginia to Tennessee and built their home along the banks of a very mossy creek. The Peck family had an immediate impact on the area and in building the community. 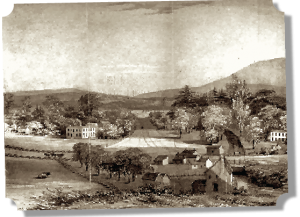 Adam’s mill became the closest for nearby settlers—who previously had to make trips to Greeneville—and he became a member of the Tennessee Assembly and a Justice of the Peace. Meanwhile, Elizabeth worked to establish a Methodist church, another first for the area, and a sense of place; the church was simple, rustic, and provided a space for the small congregation to attend services. A peaceful farm scene shows the picturesque views seen in Mossy Creek in the early 1800’s. MILLS, MINES AND MONEY. The Peck children, including sons Moses Looney Peck and Jacob Peck, would go on to serve as leaders in the community much the way Adam and Elizabeth did. Moses and Jacob both served as leaders in the Methodist church. Additionally, Jacob helped build the Elizabeth Chapel and served as a member of the Tennessee Supreme Court from 1822-1835. Not long after the Peck family built their home, church, and mill, Thomas Hume opened the first store, and in 1798 Christopher Haynes established an iron works business. 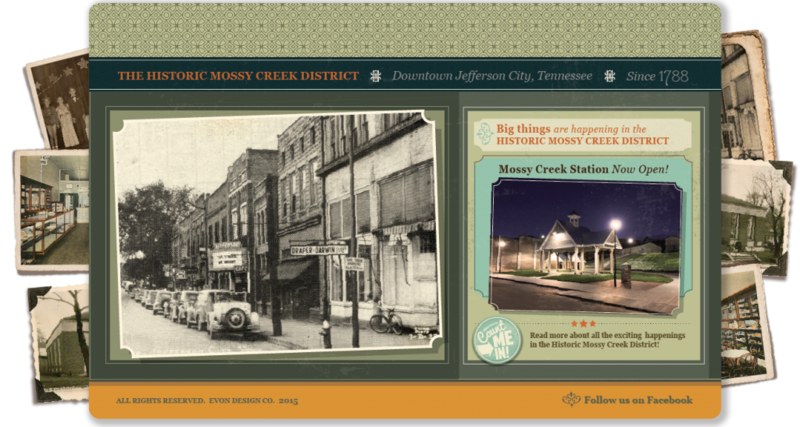 Thus, it was in large part due to the Peck family deciding to settle in the area that Mossy Creek began to thrive. The Pecks, Mr. Hume, and Mr. Haynes all contributed to the beginning of Mossy Creek’s local business and to the community that grew into what we know and love today. Big things are happening in our little downtown. Head down to the Mossy Creek Station for some Springtime fun brought to you by Carson-Newman’s Eagle Production Company. The day’s events will include food, live music, entertainment and crafts. Fun for the whole family! Bring a lawn chair and blanket and join the community for free monthly movie nights sponsored by the Modern Woodmen of Jefferson City. August 16, 2019- What’s Up Doc? Gather at the Veterans Plaza at Mossy Creek Station for a brief service of music, tribute, and the laying of a wreath in memory of veterans who died in active service to our country. Celebrate America with your friends and family on the streets of the Historic Mossy Creek District, in downtown Jefferson City, Tennessee, with a wide variety of floats, vintage cars and other participants, waving red white and blue and throwing out lots of candy for the kids. There will be lots to do and see at the 34th annual Old Time Saturday festival in the Historic Mossy Creek District. This is Jefferson County’s largest annual festival and features craftsmen and vendors from throughout the region. Nearly 10,000 people will once again fill the streets of downtown Jefferson City to honor its rich history as the once-bustling center of town. Be part of this fun-filled day and enjoy music, food, handmade crafts, and more! NEW! Light up the night with Jefferson City’s first evening Christmas parade beginning at 5:30pm with line up starting in the Mossy Creek District at 5pm. Experience great food, entertainment, photos with Santa, and the brand new Holiday Market before and after the Christmas Parade at The Vault. Free for the whole family! MOSSY CREEK BARBECUE BATTLE: NEW! Coming Soon!